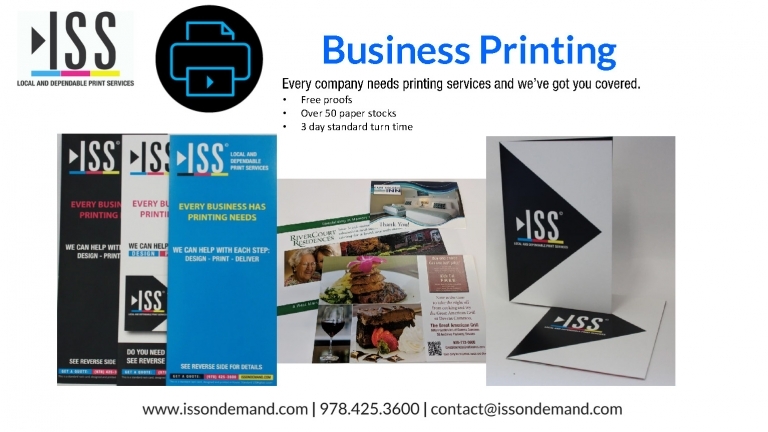 Brochures: A Sure Thing » ISS, Inc.
Good marketing requires a balance of strategies- some that follow trends, and a few that are classic, like a well crafted brochure. I know this may come as a surprise, but there’s a market of clients out there that do not rely on the internet for information but instead prefer and trust the hard copy. Brochures are versatile. A potential client can go back again and again to refer to the helpful information it provides. You can mail them, hand them out or leave them at a location. They can be printed in different formats such as menus, flyers, product guides, and newsletters, and of course the conventional tri-fold style. They can also be in an electronic format, as an online pdf, a link to a pdf, or an email-ready PDF. And, they are cost effective for smaller businesses on a budget, especially when printed in higher amounts. Consider the tactile feel of the paper’s texture, the glossy visuals, and the smell of freshly printed pages. It’s easier for the brain to retain information that has effected the senses, and no website or email can deliver such an experience. Your brochure can’t be deleted from an email box or get lost in a spam folder. To be able to physically hand over a brochure when you’re face to face with a potential client is an invaluable opportunity. It’s a chance to promote your services directly to someone as opposed to handing them a business card and delegating the task of researching your company on their own. products and services. A business that invests in a high quality brochure validates their longevity, stability, and commitment to their clients, and communicates to customers that they have reliable credentials and dependable business practices. Many clients expect to see evidence of experience and performance before they do business with you. Used to their potential, brochures are a marketing tool that can attract long term customers who rely on and believe in your business.